Much informative. Very knowledge. Such facts. 1. The word "Doge" comes from this 2005 Homestar Runner clip. 2. It didn't really pop up again until 2010, when someone made this very weird, but very popular Tumblr post. It was supposed to be like you were playing a weird role-playing computer game where you get to pet a dog. 4. ...until history was made when someone called a Shiba Inu a doge on 4chan. 5. That same month, based on the original weird Doge role-playing Tumblr post, this corgi with a tea set on his head was posted on Tumblr and quickly went viral. 6. A few months later, in the summer of 2012, the Shiba Confessions Tumblr was born. Basically it was a blog that put stuff that 12-year-old girls would say in Comic Sans over photos of Shiba Inus. 7. That's when this picture was posted on Tumblr. Which has since become the quintessential "Doge" photo. 8. 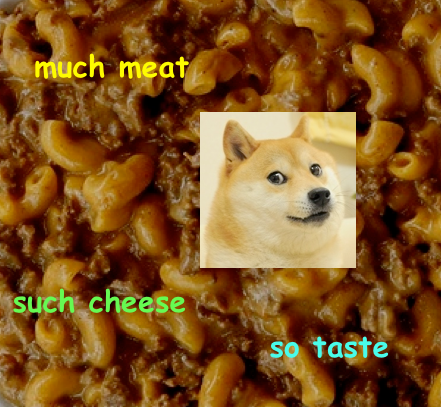 Between the summer of 2012 and 2013, Doge posts got kind of weird. 9. But most experts agree that the tipping point for Doge jokes was when 4chan users attacked Reddit's r/murica, completely filling it with Doge posts. The complete Doge takeover lasted for a day or so before the moderators of r/murica could regain control of the place. 10. It should be noted that Doge stuff doesn't have to be on just photos of Shiba Inus, it's more about just getting the general feel right. But Shiba Inus are definitely the most popular. 11. In the months since the Doge takeover of Reddit, larger places have been picking it up. This is what happens when you search "doge meme" on YouTube. 12. And the Hamburger Helper Twitter account posted this earlier this month. 14. If you're feeling burnt out from Doge, try Side-Eyeing Chloe, similar kind of vibe. 15. Doge is love, Doge is life.